Today we rode our last leg of the Fred Marquis Pinellas [bike] Trail. We have been riding sections of the trail over a number of days varying from 8-18 miles at a time. Today we made it to the northern end of the trail at John Chesnut Park along the southeastern border of Lake Tarpon. For those who are not familiar with this trail it is a retired railroad bed that has been paved for bicycle and pedestrian use. The southern trail head is at Pioneer Park in St. Petersburg. The trail is 44.3 miles long, and because we all ride together, any distance we ride in one direction we have had to backtrack to return to our vehicle. 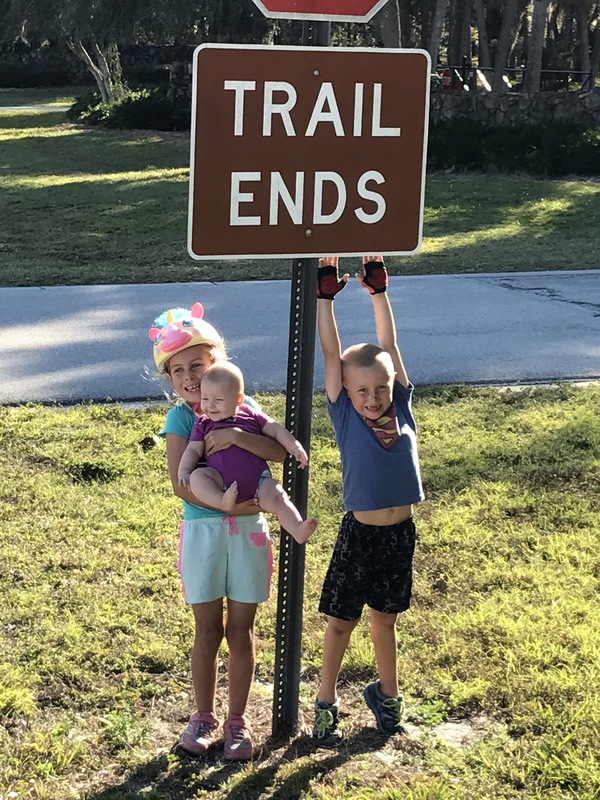 So, we as a family have ridden 88.6 miles on the Pinellas trail since our arrival in the Clearwater area in mid October. Not bad for a family with 3 children under 8 years old. The older two kids ride their own bikes without training wheels and Miss Kicky feet rides in her infant car seat nestled within the bicycle trailer behind my bike. The trailer also provides a convenient place to put a packed lunch, extra water, and the diaper bag. Heather has an attachment point for the trailer on her bike as well, but she has not been daring enough to tow the trailer on any of our trail outings. towing a trailer is certainly good for your legs and stamina. WHEW!